As published here in The Lifestyle Library. I was 14 when I had my first panic attack. Gripped in the fist of terror, I was slightly paralysed by the intensity of the sensations coursing through my body and didn’t know what to do, so I sat still taking shallow breaths so as not to arouse any further feelings of stress. Turns out, this was singularly the worst thing I could’ve done – breathing slowly and steadily forces the body to regulate itself, slowing a pounding heart and telling the frayed nerves that danger isn’t actually imminent. Breathing was my first discovery in the battle against panic. Others have emerged since. 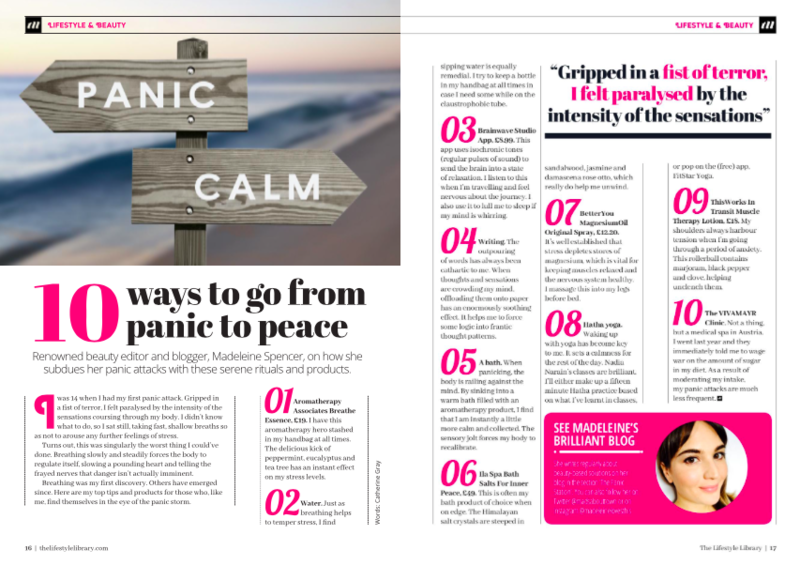 Here are my top tips and products for those who, like me, find themselves in the eye of the panic storm. 1) Water. Just as breathing helps to temper stress, sipping water is equally remedial. I try to keep a bottle in my handbag at all times in case I need some on the tube or when I’m out and about. 2) Aromatherapy Associates Breathe Essence. I have this aromatherapy hero stashed in my handbag at all times. The delicious kick of peppermint, eucalyptus and tea tree has an instant effect on my panic levels. 3) Brainwave Studio App. This app uses isochronic tones (regular pulses of sound) to send the brain into a state of relaxation. I listen to this when I’m travelling and feel nervous about the journey. I also use it to lull me to sleep if my mind is whirring. 4) Writing. As a writer, the outpouring of words has always been cathartic to me. When thoughts and sensations are crowding my mind, writing them down has an enormously soothing effect, helping me to categorise things and forcing some logic into frantic thought patterns. 5) A bath. When panicking, the body is railing against the mind. By sinking into a warm bath filled with an aromatherapy product, I find that I am instantly a little more calm and collected. The sensory jolt forces my body to recalibrate. 6) Ila Spa Bath Salts For Inner Peace. This is often my bath product of choice when on edge. The Himalayan salt crystals are steeped in sandalwood, jasmine and Damascena rose otto, which really do help me unwind. 7) BetterYou Magnesium Oil Original Spray. It’s well established that stress depletes stores of magnesium, which is vital for keeping muscles relaxed and keeping the nervous system healthy. I massage this into my legs tightly before bed. 8) Yoga and stretching. Waking up with yoga has become key for me. It sets a calmness for the rest of the day. Nadia Narain’s classes are brilliant. I’ll either make up a fifteen minute Hatha practice based on what I’ve learnt in classes, or pop on the (free) yoga app FitStar Yoga. 9) This Works In Transit Muscle Therapy Lotion. My shoulders always harbour tension when I’m going through a period of anxiety. This rollerball containing marjoram, black pepper and clove, helping unclench them. 10) The VIVAMAYR Clinic. Not a thing, but a place instead. I went last year and they immediately told me to wage war on the amount of sugar in my diet. As a result of quitting it and through tweaking my diet, my frequency of my panic attacks are much less frequent.